A flowering meadow in front of the legendary Castel del Monte which was built by the Hohenstaufer Emperor Friedrich II around 1240. 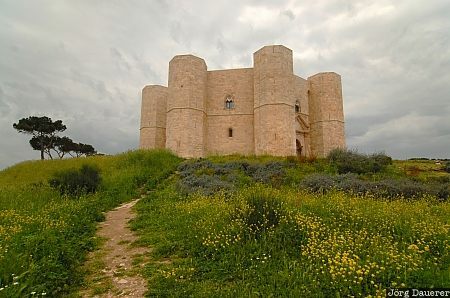 Castel del Monte is located in Apulia (Puglia) in the province of Bari in southern Italy. This photo was taken on a rainy day in late April of 2006. This photo is part of the exhibition Castles (June 2012). This photo was taken with a digital camera.